Yamaha’s new MT-01 is fast, fun, improbably agile and stops hard. 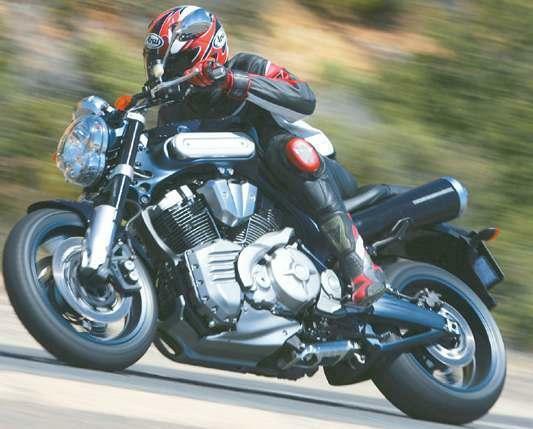 And after thrashing the 1670cc V-twin concept bike-turned-production machine on South African roads, our world first test verdict is that Yamaha has a legend in the making. Even at steady speeds it delivers a big buzz – wild styling and big torque are the key. Top speed is only around 130mph – but anything over 85mph soon gets tiring due to the lack of wind protection. But that doesn’t matter. It may not keep up with extreme sports bikes for speed. It’ll more than match them for riding enjoyment and that is ultimately what counts. Read our full first test report in MCN (out November 17, 2004). In part II of the test (in the November 24 issue) we’ll bring you our pillion opinion on the MT-01 and answer can you tour on it and… is a V-Max faster? How we rate the MT-01: We reckon in the rapidly developing Street Rod class, the MT-01 sits just behind the Triumph Rocket III, but ahead of the V-Max, Honda F6C, Harley V-Rod and Buell Lightning. Downside? At close to £9000 the price may make you think twice.